This game, in case you couldn’t tell, takes place in SPACE! Trapped in the 9th Dimension, engines down. This is your predicament; the only working device on your ship is your tractor beam, so the only way to move is to push or pull off of the nearest heavy object. But what happens if that object moves the other way? This is the premise of Gravwell, and you’d better be on your toes, because only one of you can make it out of this dimension. Try not to spin out of control. 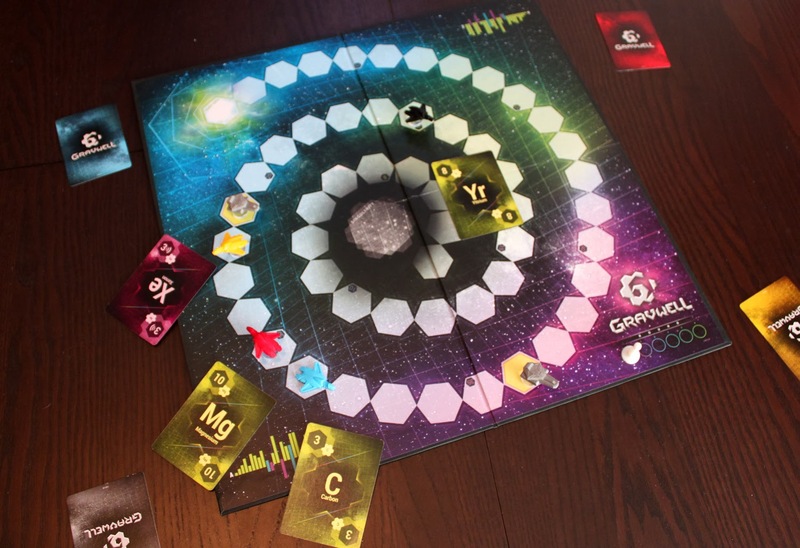 In Gravwell, players are racing to be the first to reach the “Warp Gate” at the end of the spiraling track. In order to do so, players will play cards that allow them to move a certain number of spaces; but the direction they will move depends entirely on the location of the other ships at the moment their tractor beam activates. Each round, players start by drafting cards in sets of two from a common pool (standard rules have one card face-up and one face-down, but variants allow for both face up or a random deal) until they have six cards. Once all cards have been drafted, players will simultaneously choose one card, reveal all cards at once, and then resolve them. Each card has three elements: a color/icon, a number, and a letter. The letter indicates the order the card is resolved; “A” resolves first and “Z” resolves last, with every other letter resolving in alphabetical order. The number indicates how many spaces are moved in the correct direction. The color indicates how a ship moves relative to the other ships. Green, the most common, will pull the ship in the direction of the nearest object. Purple is a repulser beam and pushes away from the nearest object. And blue pulls every other object toward the ship. The relative position of other ships only matters at the moment the card is resolved, which means that position can change unexpectedly. After six cards are played, the round is over. Players also have an “Emergency Stop” card that they can play once per round, which can cancel one of their movement cards if they don’t like where it leads them. The game ends immediately if a player reaches the Warp Gate. If that fails to happen after six rounds are over, whoever is closest to the gate is the winner. It’s no secret how I feel about Gravwell; this is one of the finest games I have ever played. 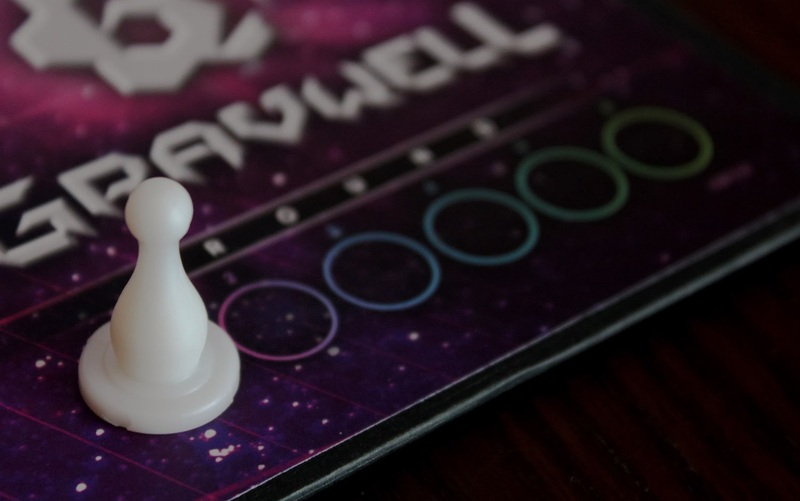 With a design featuring darker-toned hues, space-ship miniatures, and an overall appearance of a serious sci-fi game, Gravwell proves that looks can be deceiving. Despite the fact that the board is essentially a 2-dimensional track, the spiral makes it intimidating to the non-gamer. As players sit down and I explain the game to them for the first time, it is usually difficult for them to see how the game will play out. Despite the streamlined and easy-to-explain rules, I’ve seen a lot of uncertainty, of confusion, and they often seem to envision they will be left far far behind in the dust. Does this game sound fantastic yet? Wait for it. I usually start the first round by just dealing out six cards to everyone, when they’re new to the game. It’s easier for them to get a hand dealt to them rather than have them try to figure out what cards they need or even want to begin with. The game isn’t won in the first round, anyways, and the draft can be added in for subsequent rounds. The first turn is easy. Just play a green card, I say, everything in the Singularity has no mass. This works for everyone, and it’s a great way to just get the game started and show players how the cards are resolved in order. These are your tools, use them wisely. Invariably, within the first round, someone pulls way far ahead while someone else gets stuck behind, sometimes even sent straight back into the singularity. There is exuberance on one end, frustration on the other. Have I sold you the game yet? The next round begins. Suddenly, realization clicks in to both the “runaway leader” and the player in dead last. Remember, movement is based on the closest ship, and while there are a few cards that allow you to push away, a majority of cards will always pull you toward something else. The leader realizes something very important: alone, out in the front, there is nowhere to go but backward. Hope you brought some low-powered cards with ya, fella, but even then, you’re just delaying until everyone else catches up. The last player gets to discover the exact opposite; they may be dead last, but they can launch forward with ease. As players continue to play more hands, they learn more and more about timing and aim. They learn that your best-laid plans can still get screwed up royally when another players lands next to them on the wrong side of their ship. They learn that when all this slinging and flinging happens, when ships unexpectedly fly backwards or launch forwards, it’s all kinda funny. Yes, despite its very serious appearance, Gravwell is a funny game, and not funny because of jokes on the cards. In games with written jokes, like Munchkin or Kill Dr. Lucky, the jokes are funny and then you hear them one too many times and they aren’t funny anymore because you know what’s coming. I love Kill Dr. Lucky but you won’t find me playing it at every game night; it comes out once, maybe twice a year because otherwise the jokes get stale and much of the charm gets lost. But Gravwell doesn’t spoon-feed jokes, it creates humor as you play. It’s always funny when someone thinks they have a brilliantly timed play only to be foiled by the player who moved just before them and landed one step in the wrong direction. It’s funny when ships end up lined up in a row and a player moving one or two spaces forward ends up jumping all the way in front by accident. It’s funny because unexpected things happen all the time, and you can’t avoid it because you have to try and win by predicting what will happen. When you predict something and something different happens… well, it’s funny. Can’t help but take closeups of the minis. The other component is that players need each other to move forward to the end. Sure, there are a few “Derelict” vessels you can slingshot from, but unless you have an absolutely perfect mix of cards, you’ll never get all the way to the warp gate alone, and even if you did have that mix of cards, all of the other players would easily catch up to you. The point is, there is no “runaway leader” problem, and no trite solution to the runaway leader, because the game forces you to use other players to move forward. If you get way ahead, you’ll simply fly backward into the crowd, or at the very least you’ll have to limp along slowly until everyone catches up. If you’re way behind, you are much less likely to have someone unexpectedly end up behind you, so you can play high movement cards to catch up. The more players play, though, the more they learn to stay pretty close to each other. The game is all about trying to guess what your opponent is going to play, and more importantly, when they’re going to play it. You’ll have to take some risks, which will sometimes pay off and sometimes send you off in a direction you don’t want to go. In this scenario, Blue (C) moves first, towards Red 3 spaces. This means Red (Mg) will fly backwards INSTEAD of forwards. Yellow (Xe) luckily still gets to push off in the right direction, and Black(Yr) will actually end up in 2nd place! Brain-burning strategy this isn’t, but as a light game, it is spectacular. It is currently a staple opener or closer at almost every game night. It works brilliantly as a gateway game, since the rules are so easy to learn and the game teaches players as it goes along. I love watching that “Aha!” moment as a frustrated player suddenly realizes how everything fits together, and that being in last now definitely does not mean being last even in the very next turn. It’s a great way to teach non-gamers that games, even intimidating ones, can be accessible, learnable, and still fun for adults to play. I suppose if you only want to play very serious strategic games or can’t stand the idea of space or something, you might not like Gravwell. But honestly I feel like this game has near-universal appeal. I love it–me, the thematic dice-rolling interactive gamer. I’m pretty sure Lenny loves it–yes, the stodgy ol’ Eurogamer. Blake, the warmonger in my group, loves it. My sister seems to real enjoy it. It’s just fun. 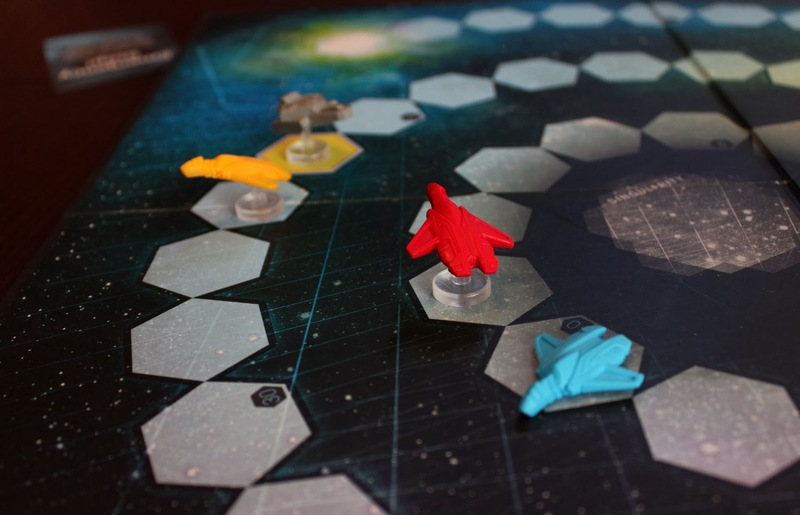 The component quality is good–cards are decent stock, the board is solid, the ship minis are cool (although a little bit tip-prone. But they’re easy to pick up and move, which is important). Many copies at Gencon had an issue with ship bases breaking off, but I’m hoping now that the game is about to be available more widely that we’ll be able to get replacement parts. Hopefully the games going into stores won’t have the same issues, and I wonder if fixing this issue was the reason it took so long to get out to the public. If I have one complaint, it’s that I wish the game could be played with five or six players. It always stinks when such a great game can’t hit the table because there is one extra person. I guess the solution would be to buy two copies of Gravwell and play two separate games. However, the game is definitely more fun with four players; the chaos just isn’t there with two, and that’s most of the fun. The designer has said on Twitter that playing with five or six would be far too chaotic. Perhaps, perhaps. But still. Okay, time to wrap up. If you didn’t catch it from the rest of the review, catch it now: this game is spectacular, an incredible light game that is fun and zany and makes a great gateway game. It does an excellent job of drawing players in, giving them a chance to see how it all works, and then hits them with that “aha” moment where they switch from uncertainty and confusion to laughter and energy. 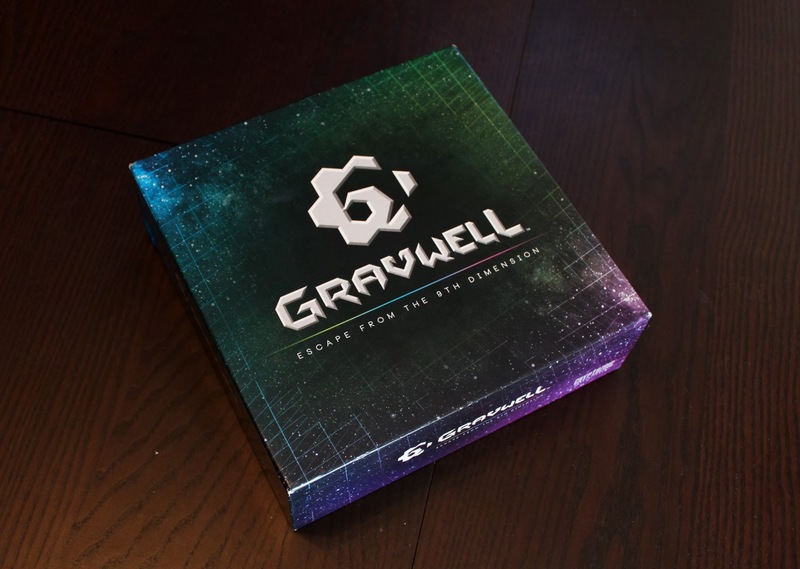 Gravwell becomes available in stores on December 20th. Go buy it. That’s an order. Usually in these nemesis reviews, the shtick is for one of us to say something and the other one to say how ridiculously off-base the first opinion was (see, for example, our review of Ra—Futurewolfie’s opinion is still wrong!). However, in the case of Gravwell, I don’t feel the need so much to contradict Futurewolfie as to temper his comments. The reason is that Gravwell is a very good game indeed, though perhaps a little less “very good” than Wolfie says. Gravwell combines a few different mechanics that I love (card drafting and simultaneous action selection) with a novel movement mechanism (objects move in relation to other objects) in a game genre that I don’t like (racing games) to create a compelling game that I’m almost always willing to play. The movement really is clever, and wrapping your mind around it the first few games is a delight. It’s not often that a game mechanism surprises me, but I was surprised by Gravwell. Because the movement mechanism is so new, the game seems harder to understand at first than it really is. After a turn or two (or, at most, a round), almost everyone knows what’s going on. Only 6 rounds to ESCAPE! I think what makes Gravwell work for me, aside from the novelty of its central movement mechanism, is how quickly it plays. I was nervous when we were in line to demo the game at Gen Con because the group in front of us was taking a really long time to play (of course, it always seems longer when you’re waiting in line). Their movement around the board seemed chaotic, like it was impossible to get anywhere, and I’ll admit, I almost lost courage and went to try something else, leaving Wolfie and our space-loving friend to try Gravwell while I found some goods to trade in the Mediterranean. But I stayed, and I’m glad I did, because when you’re not trying to make Gravwell last long, and when you aren’t bad at choosing which card might benefit you, and when you are fully invested in the game, and when you don’t spend five minutes analyzing every card in your hand and then choose the wrong one (writing about the demoers in front of us is cathartic), the game moves very quickly. It’s not uncommon for a game to finish in as little as fifteen minutes, and even in the game when I was purposely doing everything I could to make Wolfie lose and we went to the very last round (…), the game still finished in a half hour. This short game time perfectly matches the weight of the game: if it lasted any longer, I’m not sure how much I’d be willing to play it. 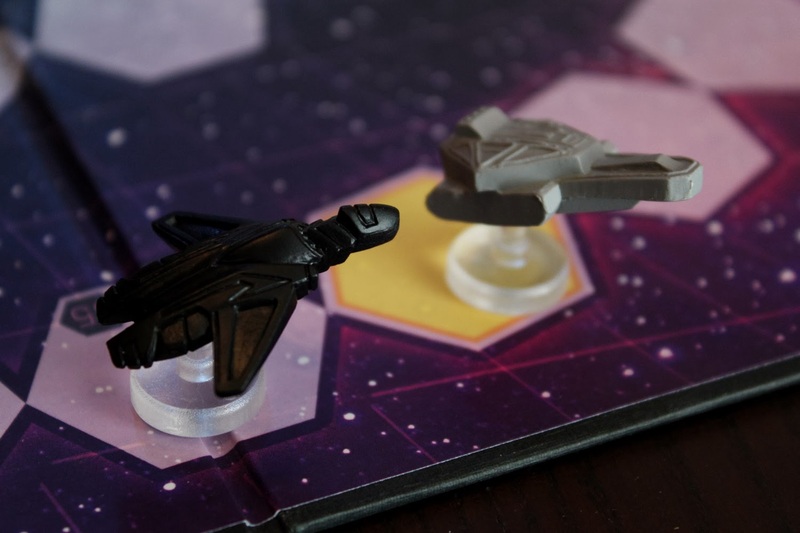 But Gravwell provides a fascinating and streamlined experience for a quick slingshot around the Ninth Dimension. 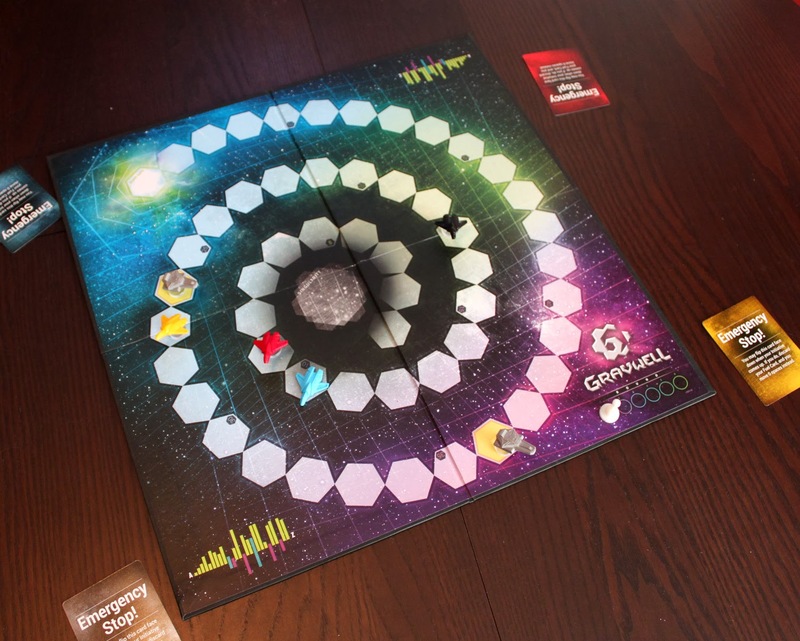 Despite my perception from the previous demoers’ game, Gravwell is surprisingly controlled—although the game’s control depends on reading other players; just as one player who isn’t thinking can throw Libertalia off its groove, so an erratic player can send ships in Gravwell spiraling into the singularity. But that shouldn’t happen often if the players are invested and playing to win, and sometimes playing a card to cause chaos is just what the players need to get the blood flowing again. The control comes from accurately (as far as that is possible) guessing what the other players are doing. (And if you really fail at this, you at least have one emergency stop.) The player-reading balance is one of my favorite aspects of the game (and of simultaneous action selection in general): there is always tension when cards are chosen and the thrill of revelation when players see where their spaceships will end up. The game rules suggest a standard draft (where each pile has one card face up, one face down, and players choose piles) and a variant, perfect-information draft. I think a perfect-information draft for this game (as in Council of Verona) would kill it for me. 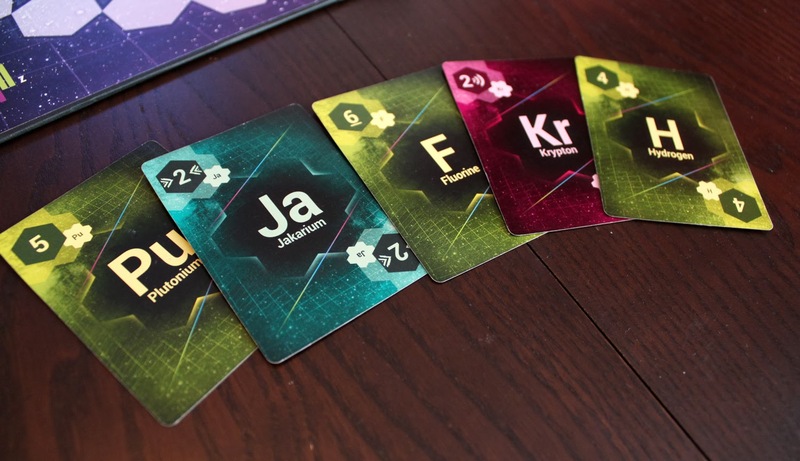 Gravwell works because it plays quickly and lends itself toward not being taken too seriously. The planning involved in a full-information draft would make the game a little too serious for my tastes, but it’s there for those who want it. I said my goal here is to temper Wolfie’s remarks, but everything I’ve said seems to confirm what he said. Where’s the difference? Whereas Wolfie used the word “spectacular”—and used it more than once (srsly? )—I would say that the game is just “very good.” I still enjoy every play of Gravwell, but it’s not one I’m itching to play over and over and over. I’m willing to play it and will enjoy it when I do, but one or two games in a session is my max, and I don’t need to play it every game night. It still feels like a race game, and while the space theme is appropriate and doesn’t bother me, it doesn’t bias me toward the game the way it seems to do for Wolfie. I like card drafting and simultaneous action, but there are other games of this weight that take around the same amount of time that I’d rather play if given the chance. And while the movement mechanism is novel, the novelty of it and the thrill of discovery wore off for me after a few games. That’s not to say that the game isn’t still fun or that it isn’t replayable—as in all games that are primarily about reading players, Gravwell has huge replayability potential—rather, it’s that the game isn’t the same kind of fun as it once was, the kind that keeps me thinking about and wanting to play the game long after the game has ended. All told, Gravwell is a very good game definitely worth checking out. I don’t love it quite as much as Wolfie does, but I do enjoy playing the game…even if I always somehow end up back in the Singularity.